The Phillies just gave Carlos Ruiz a guaranteed three year contract that covers his age-35 to age-37 seasons. In both my defense of the deal here and on Twitter, I have invoked Russell Martin’s name as a comparison, but noting that Martin was a huge bargain last winter has met with some resistance because Martin is significantly younger than Ruiz. His two year deal with the Pirates covered his age-30/31 seasons, so Pittsburgh wasn’t committing guaranteed money deep into his mid-30s, as the Phillies are doing with Ruiz. There simply aren’t that many examples of highly productive 35 year old catchers, as most catchers are on their last legs at this point in their career, and that has helped fuel the belief that catchers age very poorly. The belief that catchers age in dog years is a prevalent one, and is one of the main reasons that the Ruiz deal has been poorly received. However, I think the evidence mostly points to this idea being incorrect. 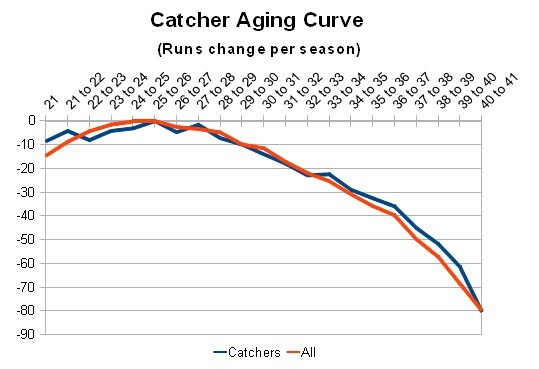 To illustrate this point, I asked Jeff Zimmerman to send me his aging curve chart for catchers over the last 30 years. He was kind enough to do so, and I’ll present it below. This chart is in batting runs relative to league average, so we’re only talking about offense here, since quantifying catcher defense is a bit of a tricky animal anyway. Since it’s a counting stat, it also factors in playing time, so we don’t have to make separate adjustments for performance and health. As we can see, peak offensive levels are from 25 to 28, as is pretty commonly accepted, and then there’s a gradual decline as a player gets beyond those years. But notice the trend of the blue line (catchers) compared to all position players (the red line); they move basically in lock-step from 27 to 32, after which point catchers actually age better than the norms for non-catchers. Here’s the table of the actual numbers represented by the chart, for those of you who are more numbers driven than graphics driven. That’s basically a straight line down from age 30, with no significant increases in performance decay at different stages. If you have a +3 WAR player heading into his age-35 season, he shouldn’t be expected to be demonstrably worse in the next season than a +3 WAR player headed into his age-31 season. The more important variable in a player’s expected future production is that player’s estimated production for the upcoming season, not his age in that season. Significantly decaying a player’s future performance because of his age is putting too much confidence in the effects of aging and not enough confidence in the player’s actual performance. Good 34 year olds don’t regularly become bad 35 year olds. In general, you should expect players to decline at something like +0.5 per season. If they’re especially injury prone and their bodies are breaking down, limiting future playing time, maybe you knock off +0.75 WAR per season. A reasonable aging curve should return a decay of something in that range, for nearly any set of years. Whether a player is 30 or 35 should not drastically change the amount of aging you expect in the future. And whether a player is a catcher or not should also not greatly affect our expectations for his future performance. In general, catchers age about how we’d expect any other position player to age. They get worse, but they don’t fall apart without notice. Expect decline, not collapse. We hoped you liked reading Catcher Aging is a Curve, Not a Cliff by Dave Cameron!